SOGS members are members of the Canadian Federation of Students (CFS), Canada’s largest student organization. CFS is composed of more than 80 university and college students’ unions (more than 500,000 students). As members of CFS, SOGS members receive benefits, including the International Student Identity Card (ISIC) and Free Tax Filing. SOGS sends delegates to the provincial and national meetings of the CFS so that we can advocate on behalf of our graduate students. If you’re interested in getting involved, contact the VP Advocacy. For detailed information on CFS’ projects and initiatives, see their Meeting Minutes here. As a full-time graduate student at Western University, and under the Canadian Federation of Students, you are eligible for a free ISIC Card. 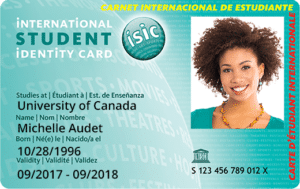 The International Student Identity Card (ISIC) is the only internationally recognized proof of full-time student status, and is a student discount card in 70 countries, including Canada. ISIC cardholders get access to thousands of discounts in Canada and over 40,000 discounts worldwide, including with ViaRail and Porter Airlines. For Federation members who are SOGS members, the cost of the ISIC card is included with membership. Others must purchase the card for $20.00. The Card is available at most student unions and at all Travel CUTS offices. If you can’t get to the SOGS office, or you need an ISIC card during a time when the SOGS office DOES NOT issue a ISIC card, please get your virtual ISIC card here. This virtual card is free for SOGS members. CFS negotiated with UFile.ca to offer students free online tax filing. UFile.ca is one of Canada’s leading online tax filing services. Although the service starts at $15.95 per use, members of the Federation are provided with a code to access UFile.ca for free all year round. Students can use UFile.ca to file taxes for their spouses, partners or dependents. The service is also available in French at impôtexpert.ca. During tax season, the Federation provides students’ unions with updated promotional materials to raise awareness amongst students about the free tax filing service. Posters include the current tax year’s access code that students enter online at UFile.ca.